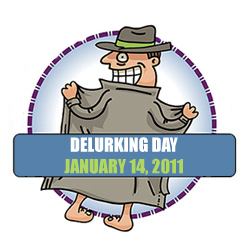 Each year the blogosphere bands together and declares a Delurking Day. What is this you may ask? Does that answer you’re question? Yes, I am asking you to flash me. Actually, it’s a call for all you quiet folks out there to leave a comment, even if it is just to say “Hi!” The thought of random folks flashing me sounded a lot more funny, huh? So, what compelling question should I ask of you dear readers? I could ask something about politics, but my forehead can’t take anymore politically motivated banging against a brick wall. I could ask you about the worst piece of parenting advice you were given, but then I would probably get all irritated because it would describe a typical day of parenting around Chez Meiners. However, besides, “have as many kids as you can as quickly as you can before your uterus is exhausted,” I haven’t really gotten a lot of marriage advice. So, in honor of Delurking Day, I want to hear the best piece of marriage advice you have filed away in your brain. It could be something you learned from your parents, grandparents, a random homeless guy with a golden voice, or something you do in your own marriage. Lay it on me! Still in the wedding planning stages, but this is one of the things I learned from watching my mother and stepfather live 17 years of what can only be the most romantic marriage ever. Every night, my parents would go through a particular doorway to head up to bed. And every night, they kiss under the archway. No matter what. Every time their wedding song comes on, they stop everything they are doing and slow dance to it, even if they are in the freezer aisle at Schnucks. (This was horrifically embarrassing when I was a teenager.) They have hundreds of inside jokes, sayings and routines like this. And they never seem to get old, they just serve to bring them closer together. The best piece of marriage advice I ever got was to have separate bathrooms. Advice? How about an observation? ‘In sickness and in health’ is the hardest part of those vows you took. My best advice would be for everyone who is married to seek counseling. My husband and I went through a very trying set of events from 2008-2010. For two years when things couldn’t possibly get worse, they did. We lacked the ability/skills to communicate effectively to one another and it drove us apart. Never in a million years did I think he would see a head doctor. But, as it turned out he agreed, and was the best thing we ever did. I couldn’t believe it. For twelve years we were in the dark trying to navigate a marriage with nothing more than a few matches. Suddenly we go to a doctor and we were given light bulbs. No one should get married without some outside guidance and tools. And no one should go through a marriage without some guidance along the way. I think it would dramatically lower the divorce rate! Thanks for stopping by. We haven’t had much time to test out marriage advice, but one of the best things that we do every day is, if I cook dinner, he does the dishes and vice versa. It’s awesome!